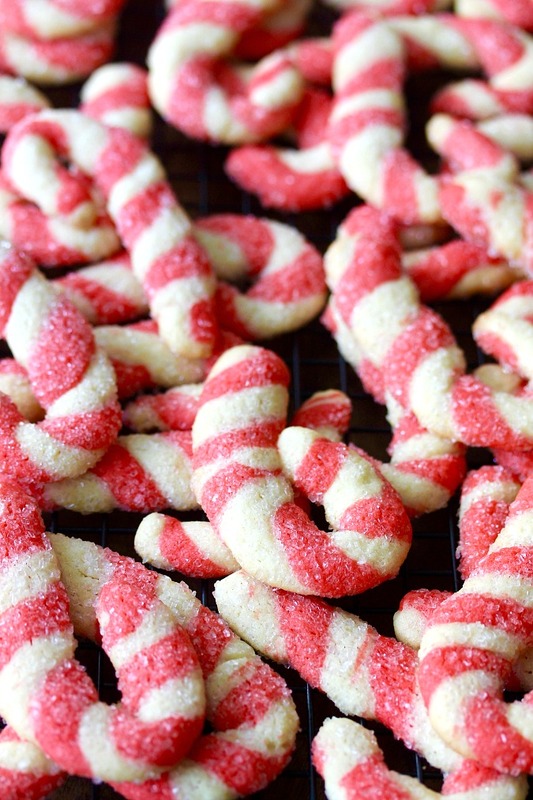 These Peppermint Candy Cane Cookies are totally fun to make, and they are so "pepperminty!" 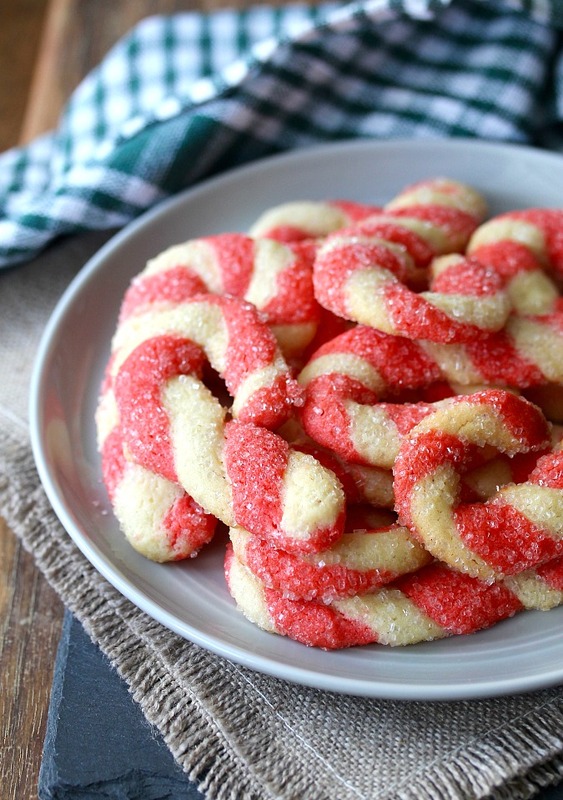 To get the twisty look, you divide the dough in half, and color one of the halves with red food coloring. Each half of the dough is stacked, sliced into strips, and then twisted into spirals. The best part for someone like me who is not the best at cookie decorating? These don't have to be perfect. "Rustic" works just fine. These cookies are great for making with kids, and would be perfect for Santa's cookie plate. Plus, they are pretty darn delicious. I rolled these in white sprinkles to make them extra sparkly and festive. Welcome to Christmas Cookie Week! All week long, over 40 food bloggers will be posting Christmas cookie recipes. We had some great sponsors for Christmas Cookie Week, including Nielsen-Massey Vanillas. Nielsen-Massey Vanillas has been crafting the world’s finest vanillas and flavors since 1907. 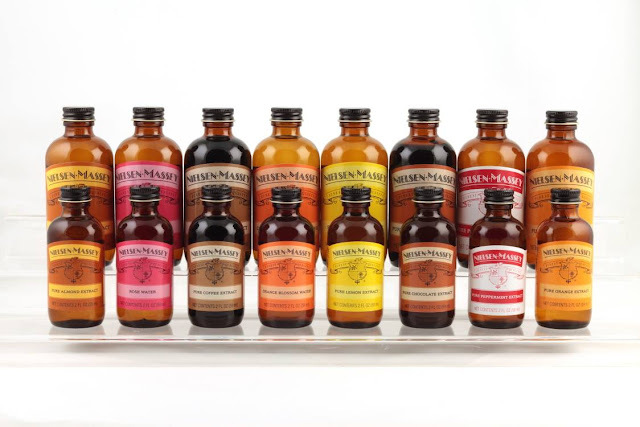 Each of Nielsen-Massey’s all-nature pure flavors are crafted with premium ingredients, sourced from around the world and chosen to meet the utmost quality standards. From lemon to peppermint to coffee or chocolate, Nielsen-Massey’s pure flavors offer convenience, quality and consistency to ensure your favorite recipes taste delicious every single time. All products are all-natural and Kosher. My favorite Nielsen-Massey product is their Vanilla Bean Paste. I always have a 4 ounce bottle on hand, and often use it whenever vanilla is called for in a recipe. Disclosure: As a participant in Christmas Cookie Week, I received a 2 ounce bottle of vanilla extract from Nielsen-Massey. After the recipe, be sure to enter to win! All you have to do is leave a comment, and there are lots more ways to increase your chances. Plus, be sure to check out the 30+ Christmas Cookie Week cookies. Links are after the recipe. In the bowl of a stand mixer, using the paddle attachment, beat the butter, granulated sugar, and powdered sugar on medium high until fluffy and pale, about 5 minutes. Add the egg yolks, peppermint, and vanilla and beat until incorporated. Reduce the mixer speed to low and add the flour mixture in 1/2 cup increments, until incorporated. Divide the dough in half. Place one half back into the mixer, and add the red food coloring and mix until incorporated. Shape each half of the dough into 5 inch squares, wrap with plastic wrap, and refrigerate for about 2 hours. Preheat the oven to 325 degrees F. Line 2 baking sheets with parchment paper and spread the sanding sugar in a shallow dish. Roll each dough piece between parchment or wax paper to a 9 inch square. Stack the two squares on top of each other, press them gently together, and cut in half, and return them to the refrigerator for 15 minutes. Using a bench knife, slice the dough into 1/4 inch by 4 1/2 inch strips. Roll the strips gently to a cylinder, and then twist into a spiral. Roll the dough strip in the sanding sugar to coat. Shape into a candy cane. Place them 1 inch apart on the baking sheets. Bake, one sheet at a time, for 13 to 15 minutes. Cool on the baking sheet for 5 minutes, and then transfer to a wire rack to cool completely. Store in an airtight container. Recipe adapted from The Perfect Cookie. 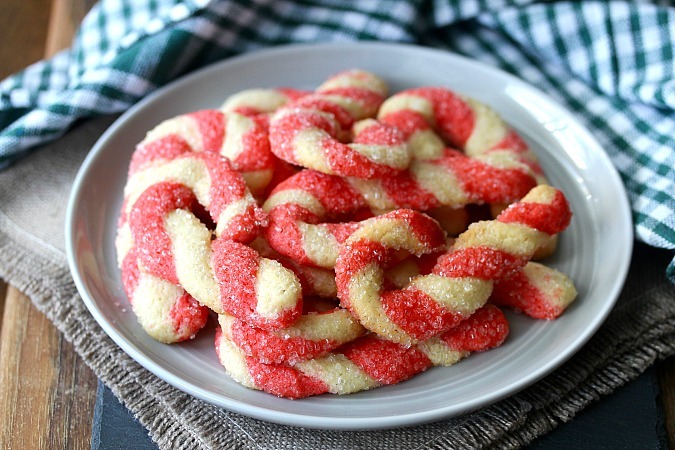 Here are more Christmas Cookie Week Recipes! These look adorable. 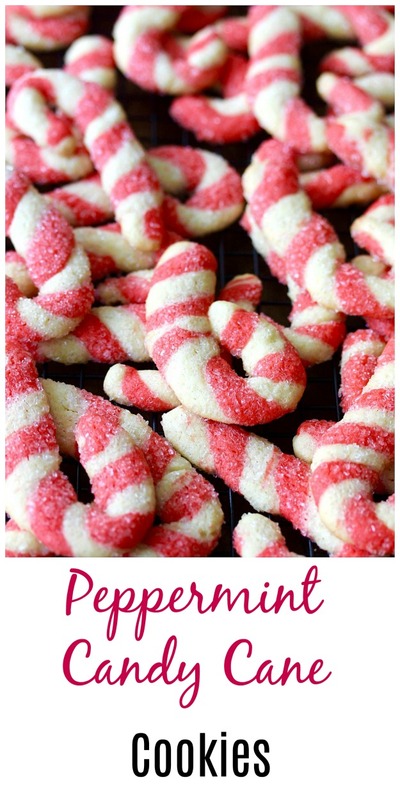 I need to add them to my holiday baking list - my kids would love them! These are so much fun! And they would be perfect for Christmas Cookie trays. I am making these this weekend FYI! And thanks for sharing on the #Celebrate365 Cookie Exchange! I'm putting these on the list to make with my Angel Face before Christmas. Thanks Ellen. These are too cute! My favorite holiday cookie is chocolate crinkles!!! 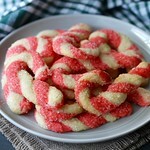 I love how consistent the twisting is with your candy cane cookies. Look good! I always trust the recipes you blog - they never let me down. I think your Foolproof Holiday cookies are a must this year because my favorite cookies are the ones with that kind of icing and maybe a little jam somewhere, too. Oh you just made my day! Thanks so much for your sweet words. These look super cute!! And I love the sugar sparkles. It makes them look sparkly and like they're covered in snow. Sparkling sugar is one of my favorite ways to dress up cookies!